What is a reward? A reward is not pay like wages. Instead, it is recognition and appreciation shown for someone who did the right thing, even when they didn’t have to. This week I’ve been writing a rare on-going series of blog posts from one topic… what God does when we are in distress and cry out to Him. And all the truths about God are found in Psalm 18 in the Bible. Up to this point, everything has been about what God does while we are in the middle of our distress, but today and tomorrow I want to focus on what God does when we have come through the trying situation. 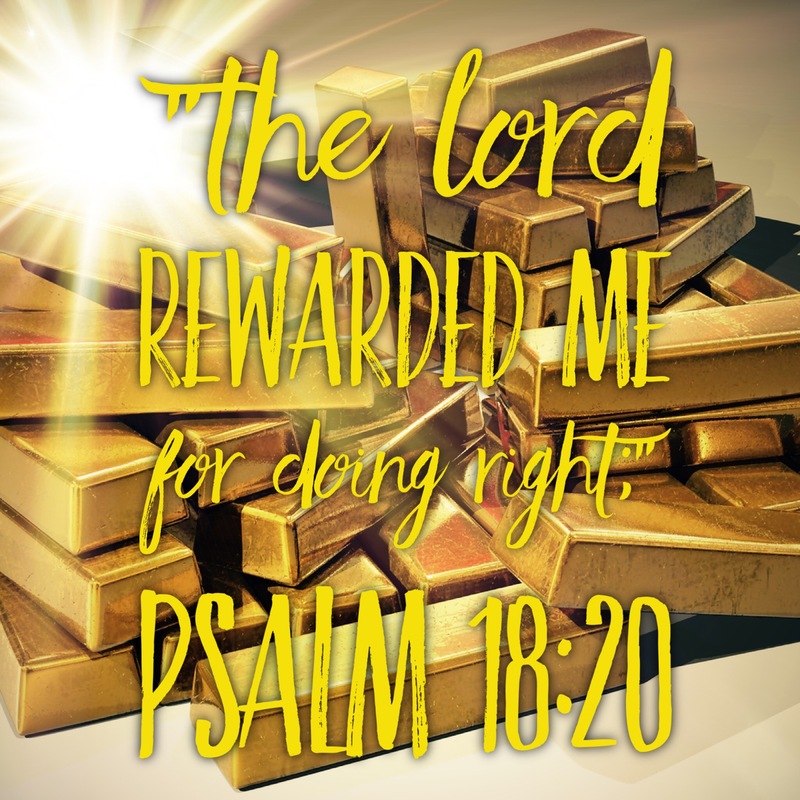 Psalm 18:20 tells us that God rewards us for doing the right thing. What right thing? Well, since this whole passage is about going through a difficult situation, then it means that when we do the right thing when we are in the midst of our most distressing times in life, God takes note of it and rewards us for that. He rewards us for keeping a right attitude when people treat us wrong. He rewards us when we keep our joy in the midst of loss. He rewards us when we are faithful and generous in our giving to the needs of others in the midst of financial challenges. He rewards us when we love instead of hate. It’s not always easy to do the right thing. When people are gossiping about you… when bills pile up… when your heart feels like it has been broken into a million pieces… doing the right thing is not always what springs to mind immediately. Perhaps scathing words, slashed tires or sucker-punches come to mind first. But when we choose to do the right thing, God rewards us for doing what did not come easiest. My sweet friend, Jeanne Mayo, often says, “Right choices/actions eventually lead to right feelings/emotions.” She’s right. If we will do the right thing in the tough times, when God has rescued us out of those distressing situations, He will reward us and we will come out of it all happier than if we had done wrong. I don’t know what distressing situation you are going through right now… and I’m sure that you really don’t feel like doing the right thing… but I can assure you that if you will do the next right thing right now, you’ll be stronger and better able to do the next right thing after that. And in the end, God is going to show His recognition and appreciation for your right choices and right actions… He is going to reward you for doing right. We wrap up this series tomorrow with one other action God engages in after you have gone through a distressing situation. Hint: Think one of those shows on HGTV where talented designers and contractors apply their skills to some house that is not too great and make it into something special.